Part Iron Man, part Thor. Hazard’s people succeed in killing a senator but a fellow senator working on a new bill is saved by Steel, although Split teleports the assassins away. Then Hazard sends Shellshock, Mainline, Split, and Hardshell to capture him, while the not-quite-dead White Rabbit watches on. Meanwhile, one of Steel’s detective friends is looking into a murder. Back with our hero, now captive in Ameritek’s secret headquarters Hazard tries to learn more about why John Henry Irons became Steel, and Shellshock finds someone being inspired to heroism thanks to family, a conscience, and a timely rescue by Superman just before the Doomsday incident an odd reason to become a superhero. John wakes up and when Hazard goes to kill him, John’s Steel armor suddenly teleports onto him. Breaking free, Steel wrecks the place and accidentally injures Shellshock until he forces Split to teleport him out of here. Split at least knows to teleport him far away as Hazard must now question this new power John showed. What they got right: This was a good framing device to go over Steel’s origin (as well as John being named for John Henry, the legendary “steel-driving man” and that role in what John Irons would eventually grow up to do) and motivations while still pushing the story forward. The fights are really good. We also get a sense of Shellshock’s personality as she has a hard time understanding why someone becomes a superhero. 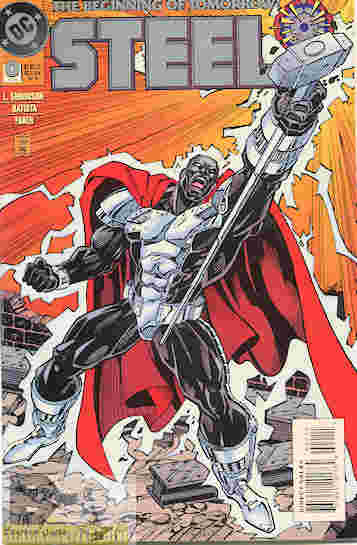 Recommendation: A good starting point for this comic and especially the few Simonson issues I have I tend to enjoy. This issue got me curious about the series. Unfortunately I started collecting under Priest’s run, which was NOT a good place to start. Posted by ShadowWing Tronix on May 15, 2017 in DC Spotlight, Yesterday's Comics and tagged DC Comics, DC Universe, Hardshell, Hazard, Mainline, Shellshock, Split, Steel (John Henry Irons).